Alberta is a pioneer in the area of sport, recreation, and fitness development for seniors. In 1976, a group of seniors, operating as the Calgary Recreation and Culture Association, introduced a Seniors Games program called 60+ OL’LYMPYX for Calgary seniors. This project was the seed of the idea from which this Association and the Alberta Seniors Games developed. In 1979 and 1980, with the inclusion of 60+ age categories in the Alberta Summer and Winter Games, a senior’s presence was established on the Alberta Games scene. During these formative years, key members of what was to become the Alberta Senior Citizens Sport and Recreation Association (ASCSRA) travelled the province at their own expense to promote the concept to existing seniors clubs and drop-in centres. These dedicated seniors talked to anyone who would listen, including senior members of the Alberta government. In January 1980, the ALBERTA SENIOR CITIZENS SPORT AND RECREATION ASSOCIATION was formed. The first Alberta Seniors Games followed in the same year at Camrose as a 75th anniversary project. They were held in August for seniors over 55 years of age and involved over 800 participants. These first Games were so successful and so impressed the premier and his ministers that the Minister of Recreation and Parks authorized the holding of regular Seniors Games every second year. Games have since been held in Camrose in 1982 and 1984, in Grande Prairie in 1986, in Vermilion in 1988, in Hinton in 1990, in Medicine Hat in 1992, in Lacombe in 1994, in St. Paul in 1996, in Three Hills in 1998, in Olds/Didsbury in 1999, Lethbridge in 2001, and Fort McMurray in 2003. The inaugural Alberta 55 Plus Winter Games were held in Edmonton, 2005, and the 2005 Alberta Seniors Games were held in Wetaskiwin, 2005. Fort Saskatchewan held the Alberta Summer Games in 2007. 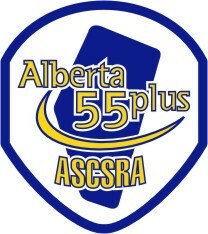 In 2007, our name changed from the acronym ASCSRA to Alberta 55 Plus! In February of 2009, the city of Lethbridge is proudly hosting the Alberta 55 Plus Winter Games. The city of Airdrie is hosting the Summer Games in July, 2009. Recently, the 2011 Alberta 55 Plus Summer Games were awarded to Fairview, with St. Albert winning with their bid to host the 2011 Alberta 55 Plus Winter Games. Over the years, members of Alberta 55 Plus have been actively involved in promoting a Senior Games at the national level. Their determination provided the impetus for the incorporation of the Canada Senior Games Association in 1991. The first-ever Canada Senior Games was held in Regina, Saskatchewan from September 11 to 15, 1996, followed by a second national Game in Medicine Hat, Alberta, August 19 to 22, 1998. Summerside, Prince Edward Island, hosted the third Canada Senior Games in September 2002. The 2004 Canada Senior Games was hosted by Whitehorse, Yukon from September 1 to 5, 2004. The last Canada Senior Games was hosted by Portage la Prairie, Manitoba, 2006. The 2008 Canada 55 Plus Games took place in Dieppe, New Brunswick, with team Alberta sending over 300 participants and winning over 250 medals! The 2010 Canada 55 Plus Games were awarded to Brockville, Ontario. The 75th Anniversary Commission approved the Alberta Games Council’s proposal to hold an anniversary games event for Alberta’s senior citizens. Seniors categories had been included in various Games events prior to this date, and senior organizers were seeking greater involvement. A group of senior Albertans promoting recreation for the older adult, formed an association to help organize the Seniors Games — the Alberta Senior Citizens Sport & Recreation Association (ASCSRA) — the first organization of its kind in Canada. Agreement struck between the City of Camrose and the Alberta Games Council confirming Camrose as the host of Canada’s first Seniors Games. The first Seniors Games were a resounding success prompting a deluge of letters to organizers and sponsors. The ASCSRA organization presented a brief to the Alberta Government proposing future Alberta Seniors Games. Recreation and Parks Minister Peter Trynchy announced funding for a biennial Alberta Seniors Games. The 1982 Alberta Seniors Games were again held in Camrose. The Alberta Games Council evolves into the Alberta Sport Council with expanded mandate for development and funding of sport in Alberta. In response to the Minister’s invitation, bids were submitted by communities to host the 1984 Alberta Seniors Games which were, once again, granted to Camrose, where over 800 participated. 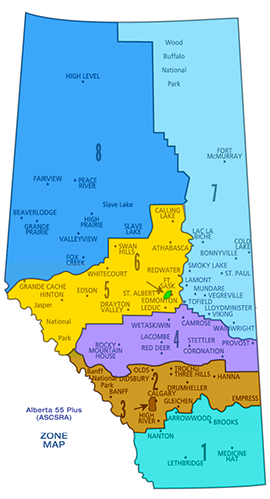 In keeping with the Alberta Sport Council’s philosophy of moving the Games throughout the province whenever possible, the 1986 Alberta Seniors Games were hosted by the City of Grande Prairie. The Town of Vermilion was selected over ten other communities to host the 1988 Alberta Seniors Games, and hosted a very successful Games with approximately 800 participants. The Town of Hinton hosted the 1990 Alberta Seniors Games with 1008 participants in attendance. Using the theme “Golden Days”, the City of Medicine Hat played host to the 981 participants competing in the 1992 Alberta Seniors Games. The Alberta Sport Council and the Alberta Recreation, Parks & Wildlife Foundation merge to form the Alberta Sport, Recreation, Parks & Wildlife Foundation (ASRPWF). The Town of Lacombe hosted 881 enthusiastic participants during the very successful 1994 Alberta Seniors Games. The Alberta Sport, Recreation, Parks & Wildlife Foundation re-organizes the staging of the Alberta Seniors Games to include the Alberta Senior Citizens Sport & Recreation Association (ASCSRA) and the Host Community of St. Paul in a three-way Partnership Agreement to host the 1996 Alberta Seniors Games. An Alberta Seniors Games Coordinator is hired by A.S.C.S.R.A. to assist the Seniors Games Planning Committee and provide consultation to the Host Community. The Town of St. Paul hosted 877 participants at the 9th biennial Alberta Seniors Games. Since 1996 was also St. Paul’s 100th Anniversary, the Games included centennial celebrations. The Town of Three Hills staged the 10th Alberta Seniors Games, hosting almost 1000 participants. The biennial Alberta Seniors Games changed to the odd-numbered years. The Towns of Olds and Didsbury jointly hosted over 1100 participants in 1999. The City of Lethbridge hosted the largest Alberta Seniors Games ever with over 1200 participants. The 13th Alberta Seniors Games were held in Ft. McMurray; a unique experience for the 1200 participants. The first Winter Games for Alberta Seniors were staged in Edmonton: the 2005 Alberta 55 Plus Winter Games. Almost 1000 participants enjoyed a number of popular winter sports and some of the summer games activities that were transferred to the Winter Games. These Games were made possible through the Alberta Centennial program. The 2005 Alberta Seniors Games (summer) were staged in Wetaskiwin. Expanded age groups and events in the remaining summer activities kept the number of participants close to 1100. ASCSRA staged Alberta 55 Plus Winter Festivals hosted in three communities in Zone 7 [Lloydminster, Vermilion, Wainwright]. Close to 1000 Albertans aged 55 and over took part in 12 activities. The City of Fort Saskatchewan hosted the 15th Alberta Seniors Games. Sixteen activities and 2 cultural competitions were held for close to 1200 participants. The City of Lethbridge hosted the first Alberta 55 Plus Winter Games recognized as a biennial program through the ASRPW Foundation. Thirteen activities were the draw for close to 1100 participants. The City of Airdrie hosted the 16th Alberta 55 Plus Summer Games. Seventeen activities were included in the Games with two being cultural competitions and brought close to 1100 competitors from all corners of the province. The City of St Albert hosted the 2nd biennial Alberta 55 Plus Winter Games, at the present 13 activities will be offered to close to 1100 participants from across the province. Cold Lake is hosting the Winter Games. Medicine Hat is hosting the Summer Games.